Bruegel's pictures were forgotten in the centuries following his death; they did not accord with the aesthetic rules, shaped as they were by the admiration of heroes, saints and potentates, by a bourgeois cast of mind or a view of Nature such as transformed it into a romantic vision. It was not until the present century that interest in him was rekindled; nowadays, the rooms devoted to his works in the Kunsthistorisches Museum in Vienna and the Musees royaux in Brussels are among the principal attractions for all art-lovers. 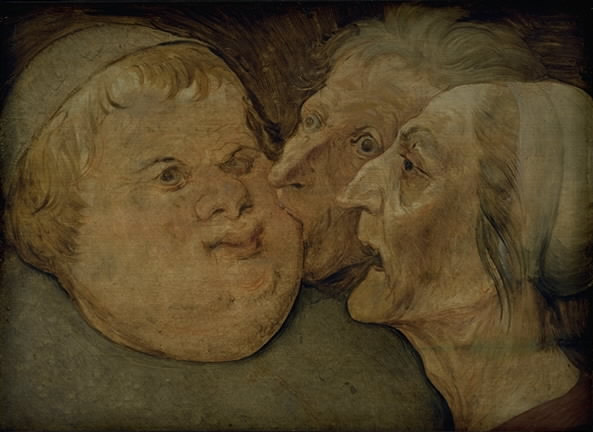 That this painter and his works should once again have been made accessible to the public stems initially from artistic innovations such as rendered invalid the conventional manner of looking at a picture. The Impressionists transformed faces and landscapes into dots of colour, while the Expressionists and Cubists "deformed" the human form. Startled and ultimately re-educated by contemporary painters, the observer became open once again to Bruegel's clumsy figures with their earthy colours and closeness to Nature, and even to the maimed bodies of The Cripples (1568). 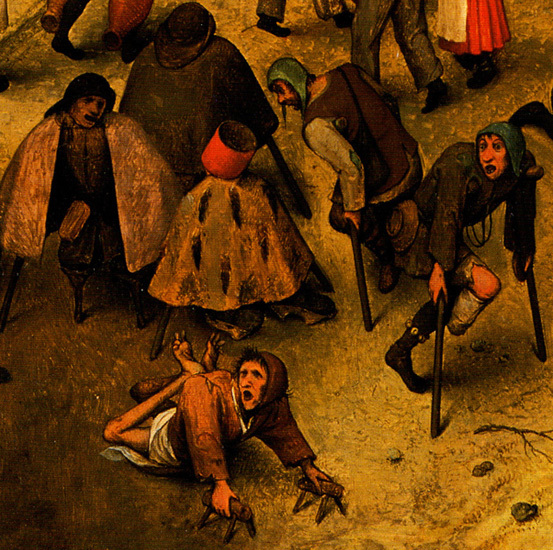 Cripples and blind people were a common sight in the artist's day, found begging along the roadside; accordingly, the fact that Bruegel included them in 1559 among the multitude thronging the market place in his picture The Fight between Carnival and Lent would not have given rise to comment. 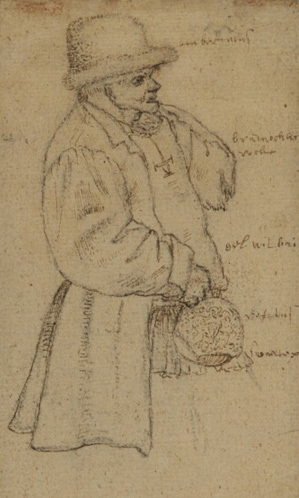 In 1568, however, the year in which he probably executed his last works, he isolated them, banishing them to a site surrounded by walls, moving them towards the observer and thereby rendering them in close-up. They are in fancy dress; their various items of headwear could represent the different social groups, with the mitre referring to the clergy, the crown to the aristocracy, the fur hat to the bourgeoisie, the paper helmet to the soldiery, and the cap to the peasantry. According to a Netherlands proverb, a lie goes like a cripple on crutches, meaning that everyone, whatever his station in society, is equally hypocritical. Such an interpretation, while making sense, seems somewhat weak in the face of the gravity exhibited by this picture. 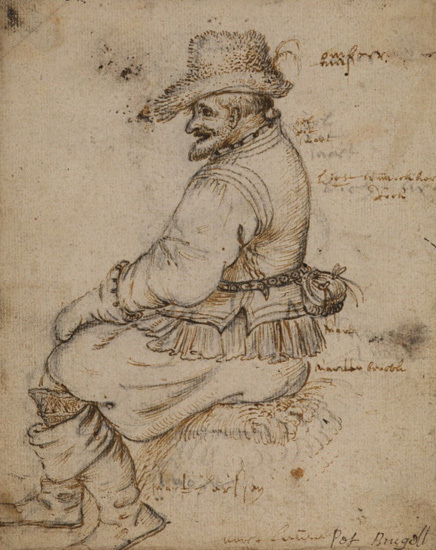 It is because of Bruegel's vision that the present-day observer finds it interesting. The artist sees the people not in God's image but as imperfect beings, the dust of the ground from which they were created characterizing them more than the divine breath which was breathed into it. Bruegel is demonstrating even more clearly than usual that the difference between man and animal is by no means as great as one might think. In taking the cripples' legs, he has stripped them of their means of walking upright. This has nothing to do with resignation; indeed, it seems more of a matter-of-fact observation. Nor is there any sense of sympathy; evidently this was relatively uncommon in the 16th century, there being simply too many beggars in the streets and in front of the churches. 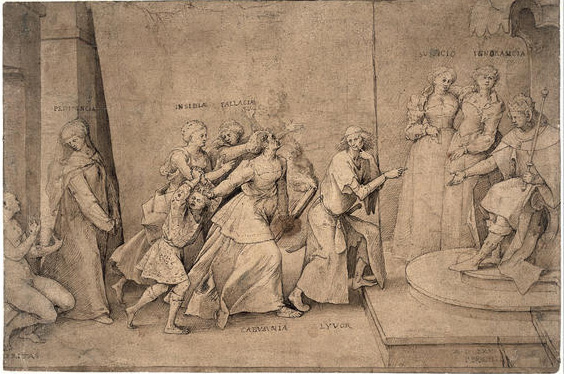 And anyway, Bruegel's concern was not so much with the beggars as such, of course, as with beggars as representatives, whether of social groups or of a specific conception of man. Bruegel's conception of man is more familiar to us than it could ever have been for an 19th-century museum visitor, for example. This is the consequence not only of the artistic innovations during the intervening years but also of the various major wars and ideological conflicts: they have rendered us sceptical towards every attempt to paint a more prettified and refined portrait of man than that to which he is in fact entitled. Yet there is also something else here. 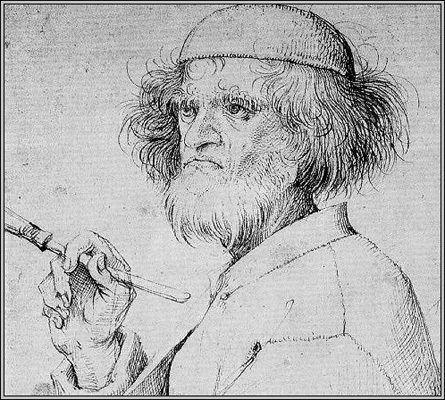 Bruegel saw man as a product of nature, from which he draws his vital energy. We live today in an era in which nature is being progressively destroyed; Bruegel's paintings, especially the large landscapes, remind us of what we are losing. 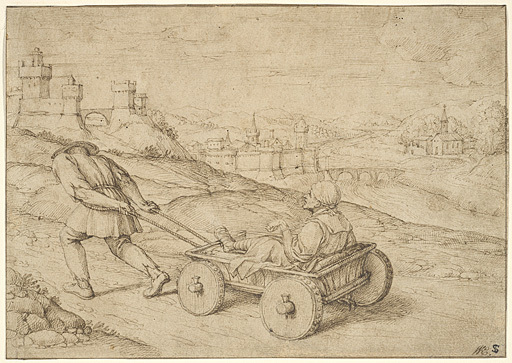 We see him not as Peasant Bruegel but rather as Eco-Bruegel. Such labels are unduly restrictive, of course; nonetheless, they serve to demonstrate what aspects of a great work are of particular relevance at a given time. 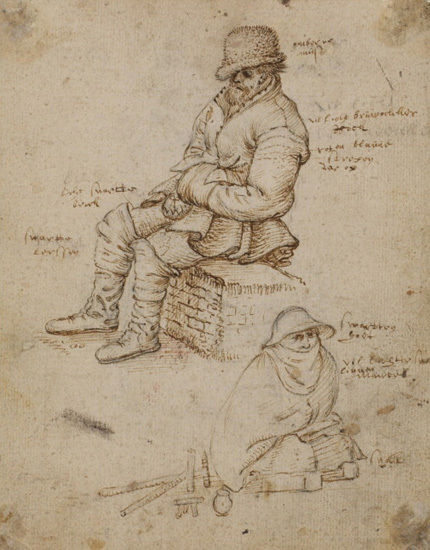 Bruegel depicts the cripples in isolation in this late picture. A woman is withdrawing, presumably having brought them food. The cripples appear excited; we cannot detect why. The different headwear could indicate the various social stations: mitre (clergy), fur hat (citizen), cap (peasant), helmet (soldier), crown (aristocrat). "A lie goes like a cripple on crutches," says a Netherlands proverb. This would mean that all of society is hypocritical. 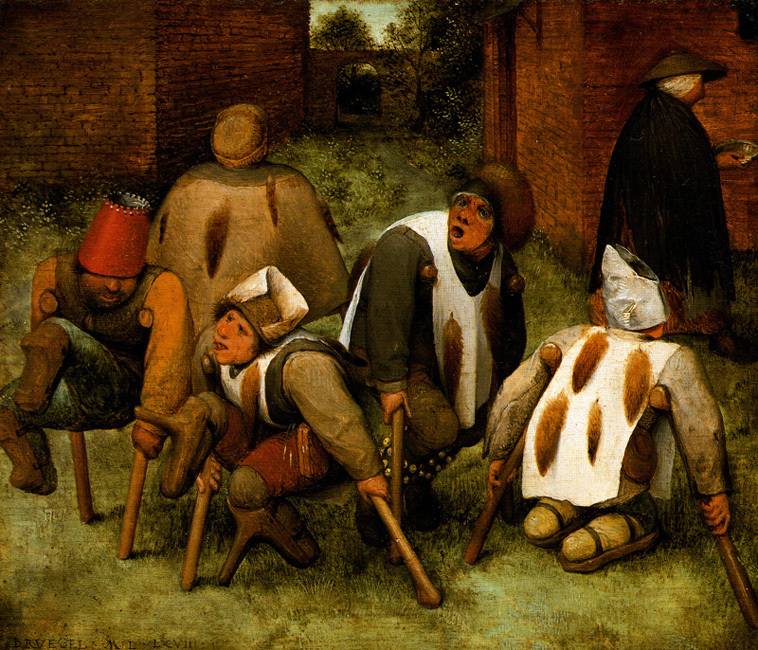 It is not this allegory which is of interest to us today, however, but rather Bruegel's view of maimed people. 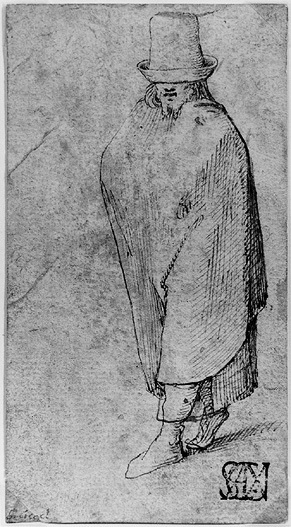 Cripples were a part of everyday life in villages and towns. 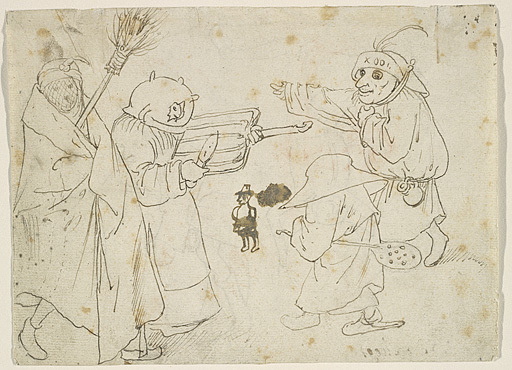 Bruegel has incorporated them as if for granted in the great company of churchgoers and men, women and children dressed in carnival costumes.